It's hard to top Marvel Studios' Hall H presentation. The comic giant unleashed new footage from Thor: Ragnarok, Black Panther, Ant-Man and the Wasp, and a teaser for a small movie called Avengers: Infinity War. 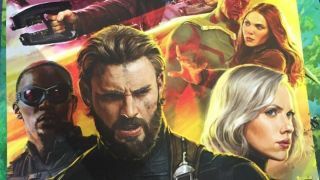 That's our first official look at Captain America in the movie, who's sporting a rather rugged beard and weary expression. No surprise there considering what he's been through post-Civil War. Black Widow gets a slight makeover and we can see more of teenage Groot!